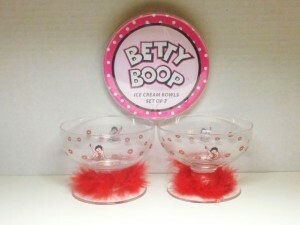 This is a beautiful set of ice cream bowls with removable fur on the bottom. They're made of glass, and hold 8 ounces of your favorite dessert. They come in their own gift package, not shown. Must be hand washed only. Please check our store listings under the category of Boop kitchen for additional products. All international & overseas buyers please email us at Boopstuff@aol.com for a shipping quote before they purchase the item. Buyer is responsible for the payment of duty & taxes to their custom's agency. 2-sp.